Convenient alu/pom brackets for bike computer or GPS. Weather alert, wind force 11-12 on the Beaufort scale, Oosterschelde flood barrier closed, in short: ideal test conditions. In 1998 I made a fast sprint along the Veerse Dam on my tailfaired M5 Carbon Low Racer. I hit 78,3 km/h (48.66 mph) back then. Now, over fifteen years later, on another bike, The M5 Carbon High Racer without any fairing but comparable weather conditions, wind speed and wind direction it's time for another try. Towards the Veerse Dam things really took off while clearing a farm in severe side winds. The HED 3 rear wheel with the wide wing shapes gave me a hard time and I managed to keep more or less upright, standing on one leg with the bike almost flat below me. A moment later two lampposts smash to the ground one by one right behind me. 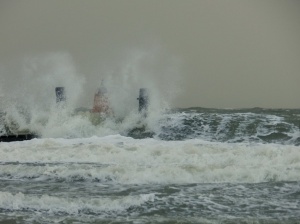 Turbulent place. On the dam itself, just after the last pedestrians bridge, is a slight bend going somewhat downwards and after that it's 300 metres full throttle dead straight. At the end I have a quick look at the meter and notice it peaked at 77.3 km/h (48.04 mph). But there are mitigating circumstances... By now I'm 57 years old, not well trained and riding without tail fairing. The best news: riding back home with wind force 11 to 12 right against me still doing 28 km/h steady-on. 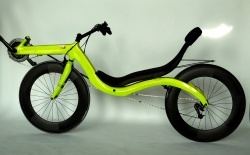 Something only recumbent riders will ever experience! After two and a half years of commuting on an M5 M-Racer, the time has come for a fresh lime colored CHR. Equipped with M5's own 90 mm high carbon rims and hubs. Also, the latest M5 lightweight carrier is mounted (directly to seat). Especially designed to support top bags and also offers protection against splashing water from the rear wheel. Carbon crankset is from fellow recumbent builder "Lightning" from the USA. Remarkable! Oldest M5 customer perhaps also customer with highest number of kilometres? 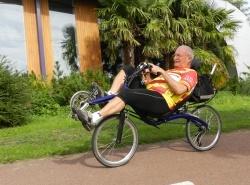 Nevio Scagliotti (80 years of age) from Amsterdam rides his recumbents 25,000 to 30,000 kilometres per year, ever since 1987! The former drummer of an Italian band from the notorious sixties already lives for 50 years with his born and raised Amsterdam wife in our capital. Weather permitting, he is riding his recumbent. Being an Italian, he only skips the cold winter months, so he covers his huge distance in just 8 to 9 months per year. His bikes are an M5 28-20 low bar from 1987 and an M5 Shock Proof from 2001. It always strikes me how well Nevio itself and these bikes still look like despite their truly bizarre mileages! The low bar version has travelled about 400,000 kilometres and the M5 Shock Proof about 300,000 km. This is close to a return ticket to the moon! These are distances which make you dazzle, especially when you hear the rider has turned 80 this year. Nevio has always been an avid (racing) cyclist, but when he saw a recumbent on a RAI exhibition he thought: "That's something for me!" Especially because he wouldn't suffer any longer from a painful crotch, neck or wrists. From that moment on a lot of trips in the vicinity of Amsterdam and many trips to his family in northern Italy were made. When asked how long he hopes to continue riding the recumbent he convincingly answers: "I feel good, so probably another 20-30 years..."
We'll attempt to follow future developments! Useful for recumbents like the M5 CHR and the M-Racer where the seat is somehow lower located between the two wheels.The bendable top plate makes it possible to create a carrier which has a water level top plate. 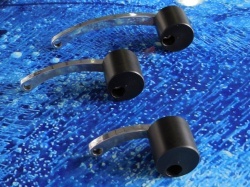 The 5 mm alu rods can be cut easily to the right length. The plate itself is bolted directly to the seat with 4 x M5 st. steel low head hexabolts. All alu parts are black anodised. Click here for a breathtaking video descending the North Cape plateau with the M5 CHR in near perfect conditions. No matter if it's M5's Low Racer, M-Racer or Carbon High Racer, all these record machines are excellent randonneurs as well! 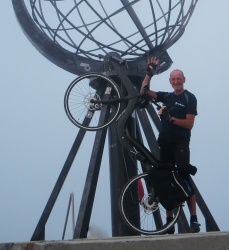 Northcape vice-versa and 1200 km as a dessert. read Arthurs daily reports. 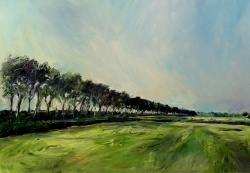 VIDEO: Sunny bike tour to the medieval centre of "Veere"
Image: painting (70 x 100 cm) from Bram Moens (road to Veere)From the M5 headquarter with M5's M-Racer and Carbon High Racer through meadows and alongside the canals: see the video! Accelerating at 48 seconds into the video without hands!